- Hospital Brochures. These are important because they let parents know that we exist. I cannot tell you how many times I have talked to a parent whose NICU baby is about to graduate who never knew we were in the hospital as a free service to them. This is why we need to put brochures on beds on a weekly basis. - Computer programs/Website. We use a lot of programs to keep our website professional and running smoothly. In order to have an organized system of scheduling, we have to pay to have a very professionally based program that works well for everyone. - Equipment. As you know photography equipment is not cheap, and the equipment we use is of the very best quality. While we do require our photographers to own their own equipment, we do have times that we need to purchase equipment for a very specific project. - Insurance/Legal. As much as we hate to admit it, insurance and legal fees come into play on a monthly basis. - Travel Costs. When a new hospital would like to open a new program, meeting with them and training new volunteers in the area is a must to insure the best possible start to the program. - Volunteer Training. We train new volunteers in hospitals nationwide so that they are well equipped with everything they need in their local hospitals. We provide on site NICU photography training, webinars, regional chapter training, and even bereavement photography training. - Capturing Hopes Magazine. This magazine, published in November, features families who have already been through the NICU journey and have come out of it with healing and hope to share with others. Publishing the magazine costs thousands of dollars and we have the goal to have this in NICU's across the country in 2017. - Miscellaneous costs. We buy things like badges for our volunteers, printing for our meetings, computers for our administrative staff, event items for community related events, and many other misc. things. 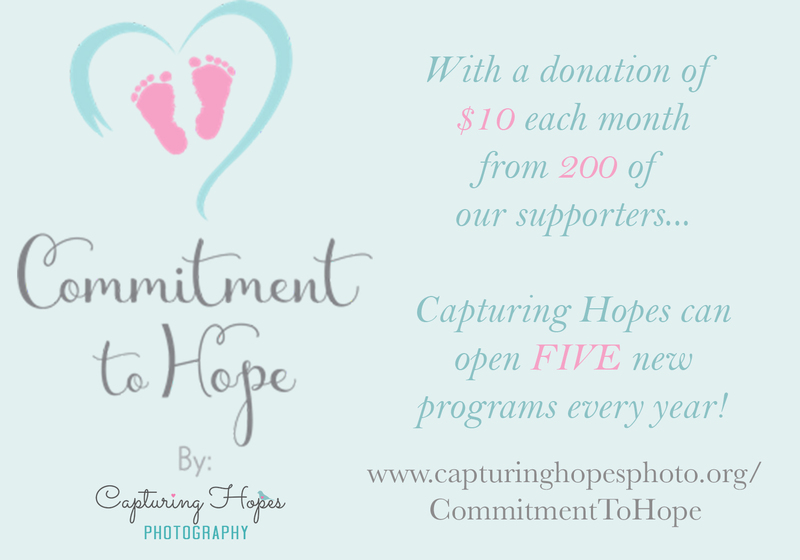 Capturing Hopes Chicago, IL - Coming Soon! Capturing Hopes Orlando, FL - Coming Soon! Capturing Hopes New York, NY - Coming Soon! Thank you for your continued support of NICU Hope!